The statue was built as a symbol of Brazilian Christianity. The statue was also to showcase everything Jesus did for us. "Christ the Redeemer" is a very significant monument in Rio. The statue is there because of the hard work of the Catholic Church to raise funds. Now the monument is a representation of the city. "Christ the Redeemer" was first conceived in 1921. Bui to Brazil and then taken up to Mount Corcovado. Mount Corcovado was chose to be the resting place of the statue because of its view of the city and it's height. 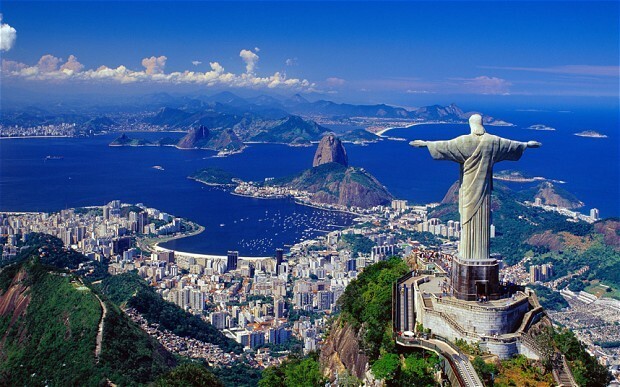 The view from the top of the statue is the best view of Rio de Janeiro. The statue is a very beautiful and amazing sculpture. It is the highest point in Rio sitting on Mount Corcovado. If you're on top of "Christ the Redeemer" you can see a 360 degree of Rio. The top of the statue is the best view in Rio. Standing at 98 feet tall and with and wing span of 92 feet the statue is the biggest Art-Deco style statue in the world. The sight is definitely one that should not be missed if you're in Rio.